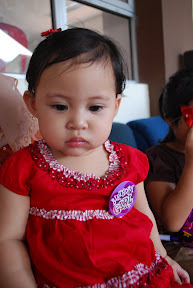 ..aryanna nadyne || full of life and hope..: My 1st Birthday BASH! The big banner courtesy of Auntie Uma! Yes, that was the day of my birthday party! Mommy, Mak Lel and Pak Su prepared the party packs the night before and I was thrilled. After breakfast Mommy showered me and after that I sat and watch TV while everyone was busy getting ready to prepare for the party. Mommy and Mak Lel went out to get my cake while I stayed home with Dadda and Aunty Huda to decorate the room where the party was to be held. Mommy had tried to make me sleep for a while around 2pm, before the party started but I was excited and didn't want to. I was so adamant that Mommy finally gave up and wore me my new dress and got ready herself before taking me to the clubhouse. At the clubhouse, people were starting to arrive. Around 4pm, almost everyone had arrived and were eating and chatting away. Everybody I know was there. There were balloons and presents and a big banner that said 'Happy Birthday Nadyne'. Dadda holding me infront of my big banner! Look at all the yummy food. Catering contacts thanks to Auntie Alma! My Little Einsteins Special Birthday cake. Thank you Mommy! Unfortunately, by the time everyone had arrived and it was time to cut cake, I was already feeling tired and really, really sleepy. Now I know why Mommy had desperately wanted me to sleep before the party. If only I listened to Mommy, I probably wouldn't be as tired! As a result, all photos taken on that day were with my gloomy face on. Yes, I'm excited inside, but sleepy on the outside.. 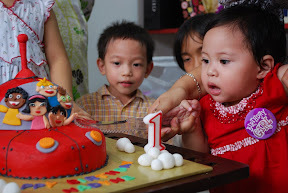 Anyway, we did blow the candle and cut the special cake Mommy bought for me. It was in the shape of my favourite cartoon, 'Little Einsteins'. The cake tasted nice too! All the kids who came to my party received a party pack each. Cousin Nadhrah was not there, though, because she was in Sabah with Ayah De and Che De. So, we kept a couple of party packs to give it to her when we see her the week after. Time to blow the No 1 candle! With my beloved Mommy & Dadda + the Cake..
After eating my birthday cake, everyone got ready to go down to the pool to have a swim. Mommy, Mak Lel, Aunty Huda and Pak Su stayed back to help pack the food and things to be brought back to our house. Dadda took me back first to get myself ready for the swim. Everyone enjoyed themselves at the pool. Some didn't even want to come out, including me! My guests enjoying a dip in the swimming pool! Finally, around 7pm I had to come out of the pool because it was getting dark and some guests are still at our house. At home, Mommy showered me and fed me with some milk afterwhich I slept like a log! Imagine how tired I was! Mommy woke me up around 9pm to open up presents. Tok Mama had finally arrived from London and Aunty Min had picked her up from the airport and came straight to our house. Uncle Nuar had also finally arrived. Mommy put me on her lap and started opening the presents, one by one, telling others who each presents were from. There were quite a number of them and I thank everyone who gave me those nice things. Gifts opening session. Thank you alll!!! Another mobile phone, this time it's Elmo!! We took some photos of me with my presents and after that, said goodbye to everyone. Later that night, after everyone had left, we went out with Pak Su, Aunty Huda, Mak Lel, Pak Long Imal and Aunty Ina. After a long day, we ended it with a nice cup of coffee before retiring to bed. Me, presents and with my dynamic duo 'Godmothers': Auntie Huda & Mak Lel! The celebration wasn't over though, we were going bowling the next day and I had fun during bowling too! 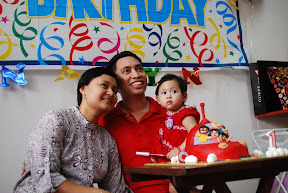 So, now you know that I really had a blast and my 1st birthday celebration was unforgettable! You can click here for the full album link or just enjoy the slideshow below! Love the banner. May I asked where can I purchase the same banner?